Duvals, the oldest surviving house in Rockland, today demonstrates the changing tastes of the last 150 years. Originally a Gothic cottage on Belcher St, later called Rockland Av, it was greatly expanded 50 years later. The original cottage, whose front faced E, was 1½-storied and steeply-cross-gabled with an extremely steep through-the-cornice wall dormer on the left side and an angled bay with a flared peaked roof in the front gable. There was a wrap-around balcony on the upper floor above a wrap-around verandah, both with stickwork balustrades. The verandah and balcony are reminiscent of the contemporary Wentworth Villa, 1156 Fort St, Fernwood. The verandah had a wide angled bay to the left of the main door. There were two corbelled, split-stack brick chimneys and one wide, panelled brick chimney. By the 1900s the upper balcony had been removed and replaced by a hipped roof over the still-existing parts of the verandah. A gabled roof was added over the far right side of the verandah. In 1910 Harry Barnard had James & James modernize and expand the home. They reversed the house, making the W façade the front, where a porte cochère was constructed. They added a 1½-storey extension creating a third gable on that side. In 1914-15, C. Elwood Watkins designed the deep angled bay on the SE side which is the dining room. Photographs indicate that between 1948 and 1977, the open porch on the south was filled in and through-the-cornice wall dormers were inserted in the roof, possibly during the 1954 conversion to five suites. A pedimented gabled entry porch was added between the enclosed porch and the dining room bay, with a small balcony above. The house is now stuccoed. John and Elizabeth Miles were the first residents. John was a clerk and accountant under Col. Moody in 1859. In> 1861 he married Elizabeth Meeson, a young widow living at Cary Castle (1401 Rockland Av). He died at 35 two days after his marriage, and Elizabeth left the house soon after. She later bought Cary Castle, sold it to Gov Arthur Kennedy and it became the first Government House. By 1871 she was living in Sooke district. Elizabeth sold this house to Vancouver Island Chief Justice Joseph Needham in 1865. He succeeded David Cameron, brother in-law of Sir James Douglas. Needham resided here with his wife and daughter Selina Maude. The Needhams entertained frequently at this rural cottage, and they also visited neighbouring Cary Castle for various high society events. Although Vancouver Island and the mainland colonies joined in 1866, there were still two supreme courts for the first three years of the colony’s existence. Judge Matthew Begbie was chief justice of the mainland. Needham resigned in 1870, was called to serve as chief justice in Trinidad and Tobago, and was knighted that year for his services. Needham retired in 1886 and returned to England where he died in 1895. The Barnard family bought the house in 1870. Francis Jones Barnard (1829-1889), born in Quebec City, started in the family hardware business. In 1853 he married Ellen Stillman (1825-1889), and they moved to Toronto. In 1859, Francis left his family and travelled via Panama and San Francisco to BC to seek his fortune in gold. He staked a claim in Yale, sold it making a small profit, then was a constable and later a purser. He eventually earned enough to bring his family to BC. In 1860 Francis established his first express mail service, carrying letters on his back from Yale to the Cariboo Gold Rush, a 760-mile round trip on foot. He earned $2 per letter, and sold newspapers for $1. In 1862 he began a pony express. Large amounts of gold were being transported to Victoria, and Francis gained a reputation for reliable and secure delivery. In 1862 the government began building the Victoria wagon road from Yale to Barkerville, and Francis established Barnard’s Express & Stage Line, “the BX Express,” equipped with 14-passenger, six-horse coaches. Francis expanded in 1864 and bought out Dietz & Nelson (who ran from Yale to Victoria) in 1866, giving him a monopoly over the entire route. Steve Tingley (1564 Rockland Av), a driver who became his partner, in 1894 bought out the Barnards and renamed it the BC Express. 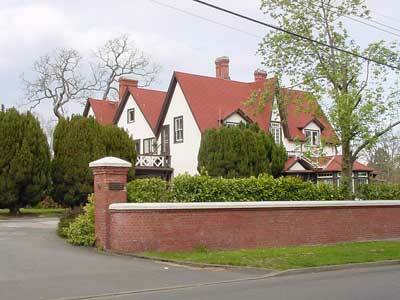 Francis moved his family from Yale to Victoria in 1868, and to Duval Cottage in 1870. He was MLA for Yale in 1866-70, and in 1879 for Yale-Kootenay. In 1870 he took road steamers (like railway steam engines) to the Cariboo, but they were ill adapted to treacherous wagon roads and the business failed. In 1874 he won a contract to build 700 miles of a transcontinental telegraph line from Fort Edmonton to Cache Creek. He bought the equipment, but the route was changed twice, delayed, then cancelled in 1878, with a major financial loss. A stroke in 1880 left him an invalid until his death in 1889. The Barnards’ children were Francis “Frank” Stillman, Alice Telfer and George Henry. Alice (c.1859-1906) married John Mara (750 Pemberton Rd) in 1882. Frank (1856-1936) was born in Toronto and married Martha Amelia Sophia Loewen (1865-1942) in Victoria in 1883. They lived at Duvals for some time, but by 1901 had moved to Esquimalt and in 1908 to Clovelly, overlooking Esquimalt Harbour (demo’d 1960). Frank became general manager of the Express in 1880, president in 1882. In 1883 he formed the Victoria Transfer Co and merged it with the Express. He represented James Bay Ward on Victoria City Council from 1886-87. In 1888 and 1891 he won the federal seat for Lillooet-Cariboo. In 1894, Frank established the Consolidated Railway Co, which he sold in 1896 to English financiers, who formed the BC Railway Co. Frank was managing director until resigning in 1898. From 1914-19, Frank was Lieutenant-Governor of BC. He was knighted in 1919, then he and Martha retired to Clovelly. Harry Barnard (b. Victoria 1868-1954) lived at Duvals most of his life. Born in Victoria, he went to Rev Cridge’s school, then Trinity College in Port Hope, ON. He came back at 16, and entered the law offices of Eberts & Taylor. Called to the BC bar in 1891, he later founded the law firm of Barnard, Robertson & Heisterman. In 1895 he married Ethel Burnham (née Rogers, 1871-1961) in Ontario, and they returned to Duvals. Harry representing James Bay on Victoria City Council in 1902-03, and in 1904-5 was mayor of Victoria. He was the first president of the BC Liberal-Conservative Assoc in 1908. From 1908-17 Harry represented Victoria in the Federal Parliament, then was appointed to the Senate. He retired in 1945.